Set on 11 acres of exotic tropical gardens in the heart of the Ka`anapali Resort area on one of the finest stretches of Ka`anapali Beach. All studios and suites offer fully equipped kitchens so you can stock up on your favorite foods. 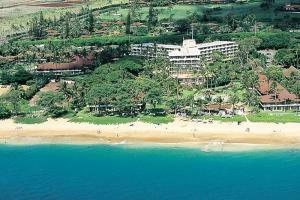 Guests can swim, snorkel, surf, or sail at Ka`anapali Beach, or just take a stroll down the beach at night. Just minutes away from Whalers Village and Lahaina, you'll find scores of fine restaurants and shops. Beachfront, on Kaanapali Beach next to the Royal Lahaina, approximately 45 minutes from Kahului Airport, 5 minutes from Kapalua-West Maui Airport.